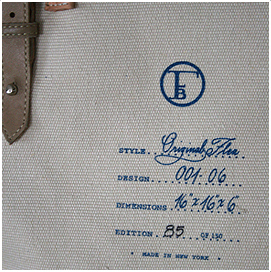 Lundfelt will gladly accept returns within 14 days of date of purchase for full refund with original receipt. gift returns must be accompanied by the gift receipt and are eligible for exchange or store credit only. shipping charges are non refundable. we ship via UPS and therefore not able to ship to PO Boxes. we have standard shipping charges for the following delivery services within the United States through UPS. we do not ship internationally at this time. orders placed before 1pm EST will be processed same day. orders processed after 1pm will be processed next business day. you will not be charged until order ships. if you'd like to send an item as a gift, please check the box labeled gift box while checking out. items will be wrapped in tissue and packaged in our signature Lundfelt gift box with ribbon. there is an additional charge of $3 for gift packaging. some items are not available for gift packaging at this time. all purchases are tax free unless shipped within the state of New Jersey. the state of New Jersey requires Lundfelt to collect 7% sales tax for items shipped within the state. Lundfelt gladly accepts Visa, Mastercard & American Express. we do not accept personal checks at this time. please contact us and we'll provide a return PO Box. don't forget to include original receipt or gift receipt. all our vintage pieces have age and with this age comes natural wear and tear. we would be happy to send jpeg photos of additional angles of any piece in our collection. please note most of our vintage pieces are one-of-a-kind and multiples cannot be ordered. if you are looking for a specific vintage piece, we'd love to find it for you. please contact us and we'll be in touch shortly.